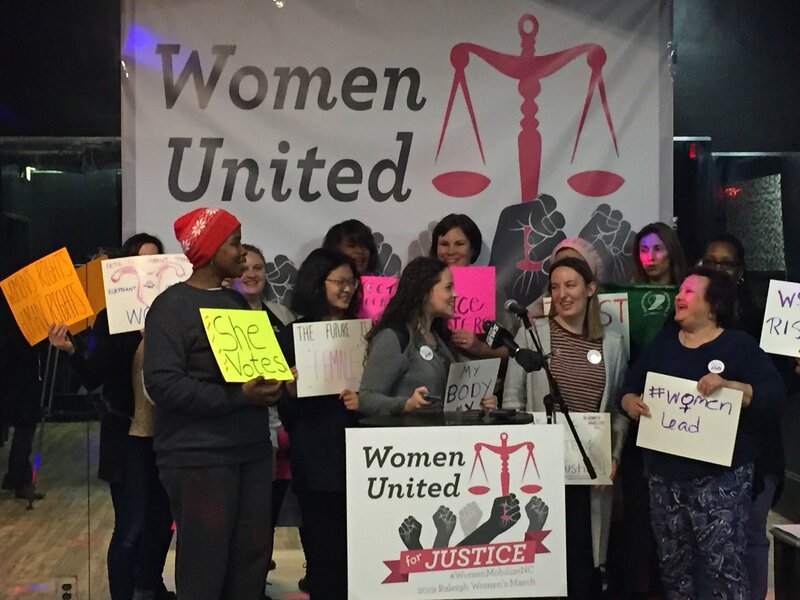 Theme: Volunteers chose “Women United For Justice” because they want to work together for a more fair and reasonable state and country. This theme was chosen at two planning meetings in December. 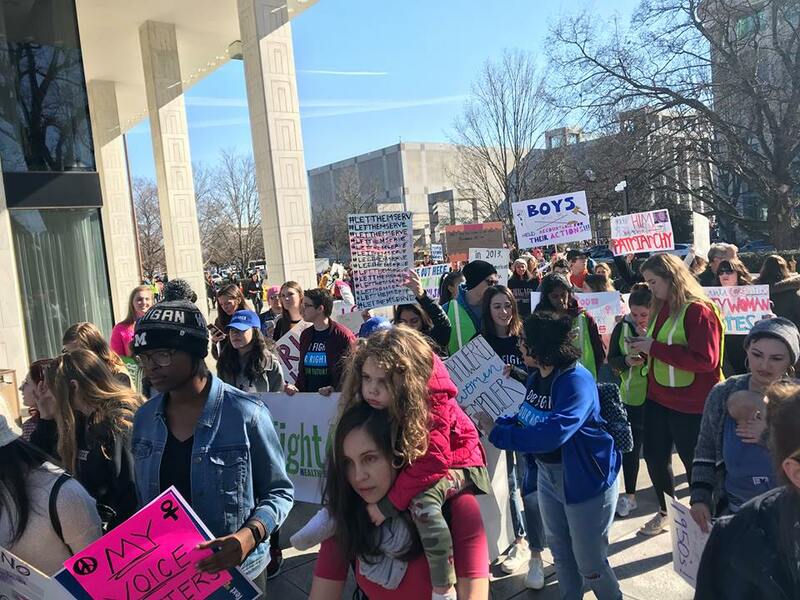 A march and rally were both scheduled, unlike 2018 when Raleigh had rally only. 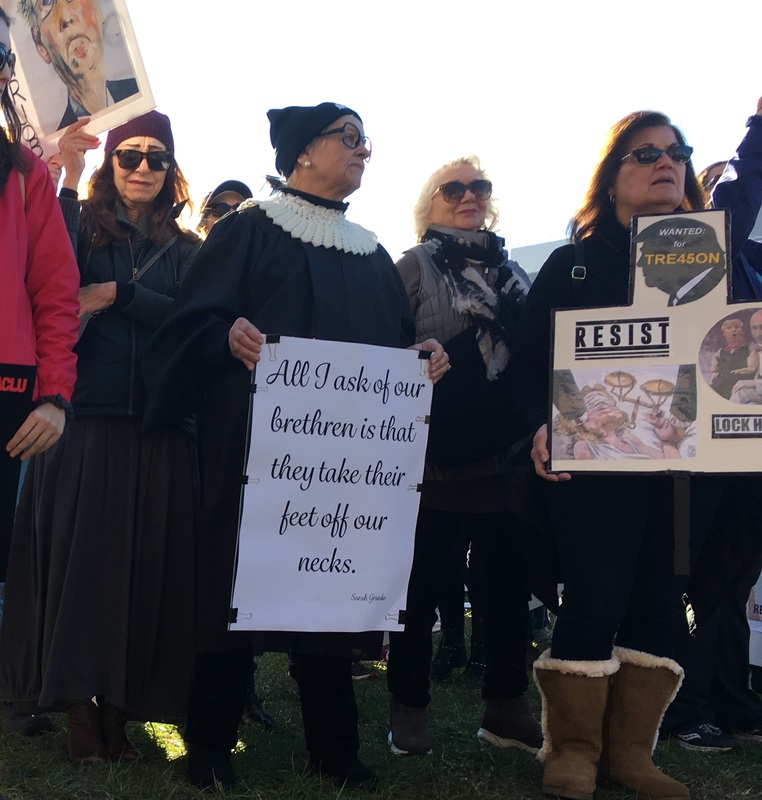 Women and allies are not stopping at the marches. The marches provide a foundation for our activism in the years to come. We will continue to speak truth to power. We will continue to emphasize intersectionality, ensuring that none of our sisters are left behind. 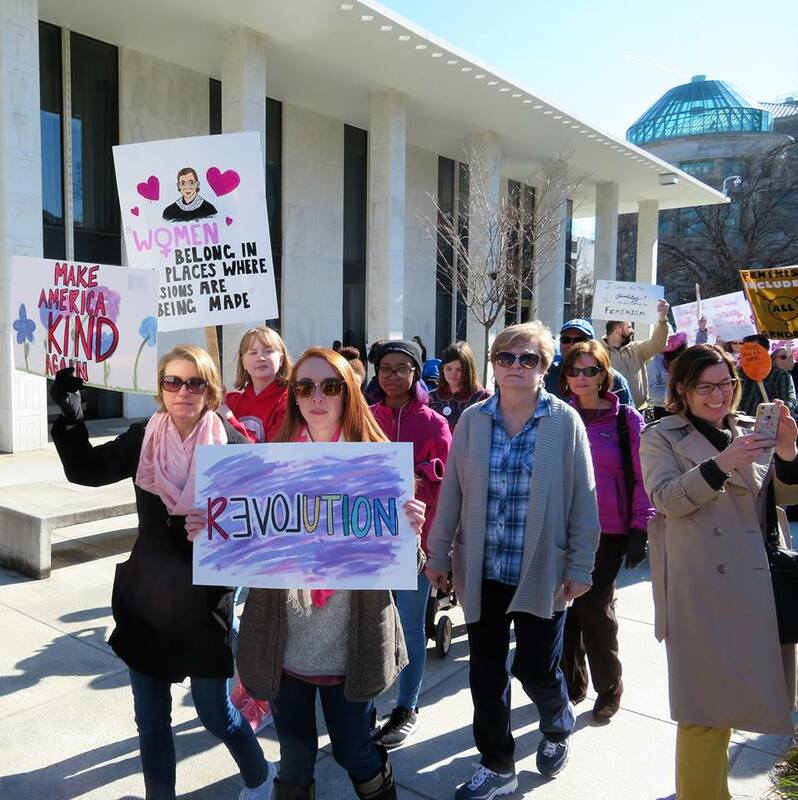 March: People gathered at the front of the Legislative Building at 16 W. Jones St at 12:30pm. The permit had marchers stepping off at 1pm around the Legislative Building on the sidewalks (once or twice), then back to the front of the building, from where they could go close around the building to get to the Pedestrian Bridge that crosses to Halifax Mall. 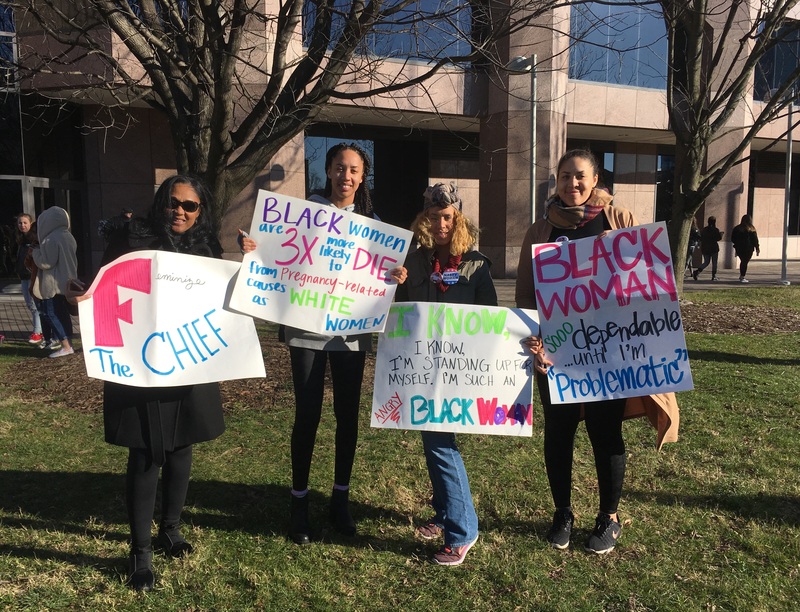 There were so many women and allies all around the Legislative Building that there was confusion over where people were going, and some police officers routed people over the bridge without marching. Marshalls had chant sheets, and at least one head of the march had a loudspeaker, but people ended up going to the mall many different ways – some across the bridge, some from the Legislative Building side, and some went around Halifax Mall on the sidewalks, and entered Halifax at different points. On the sidewalks (as on permit). 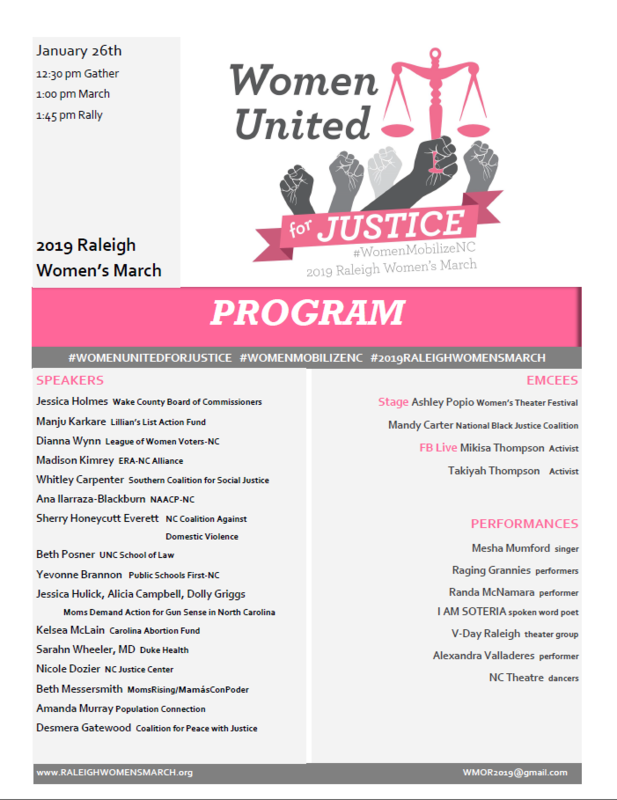 Speakers and performers: The Raleigh Women’s March scheduled 17 speakers and 7 performances in two hours, from 1:45pm to 3:45pm. Here is a copy of the program with community partners on the back. 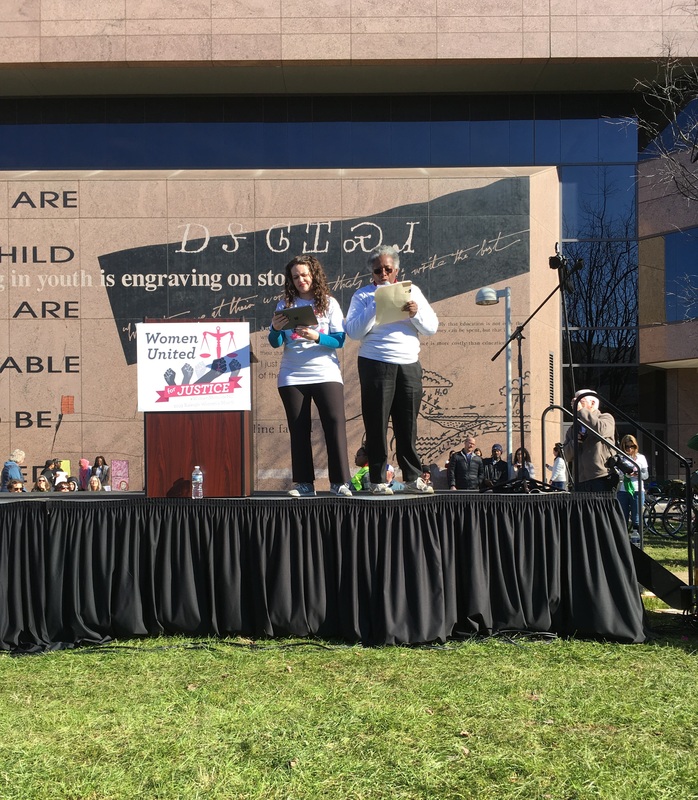 Our co-emcees were Ashley Popio and Mandy Carter. We had co-emcees for Facebook Live as well. They interviewed speakers and performers when they got off the stage. 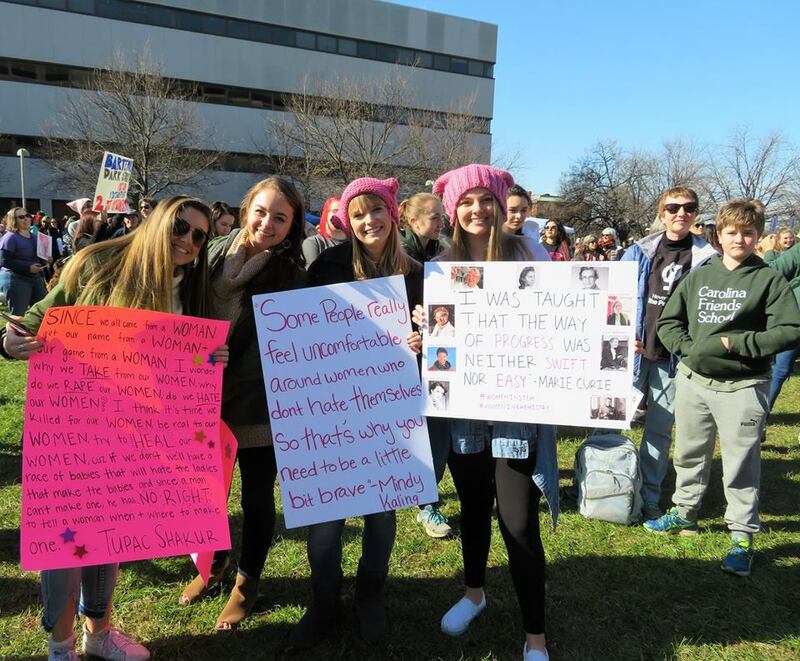 See pictures and some biographies of emcees and speakers on the Raleigh Women’s March page. 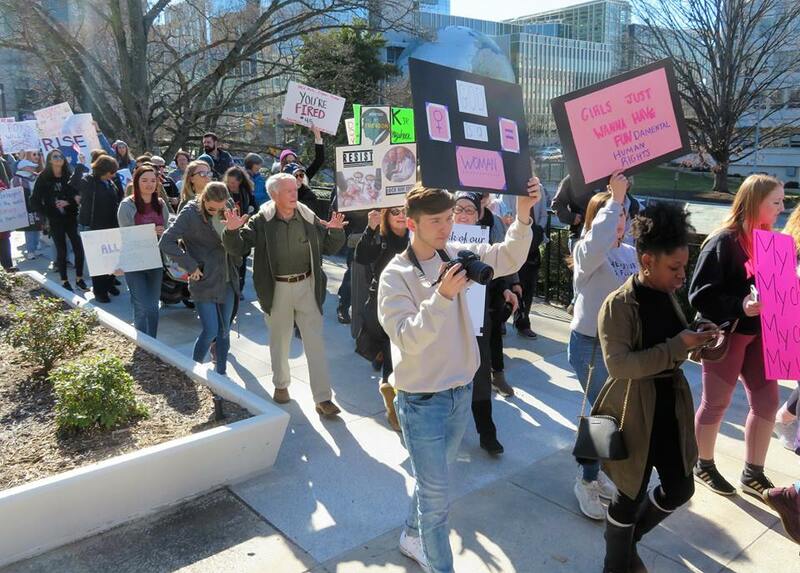 Watch footage of the march and the rally with WRAL at https://www.wral.com/news/video/18149663/. Plus we had co-emcees dedicated to facebook live. 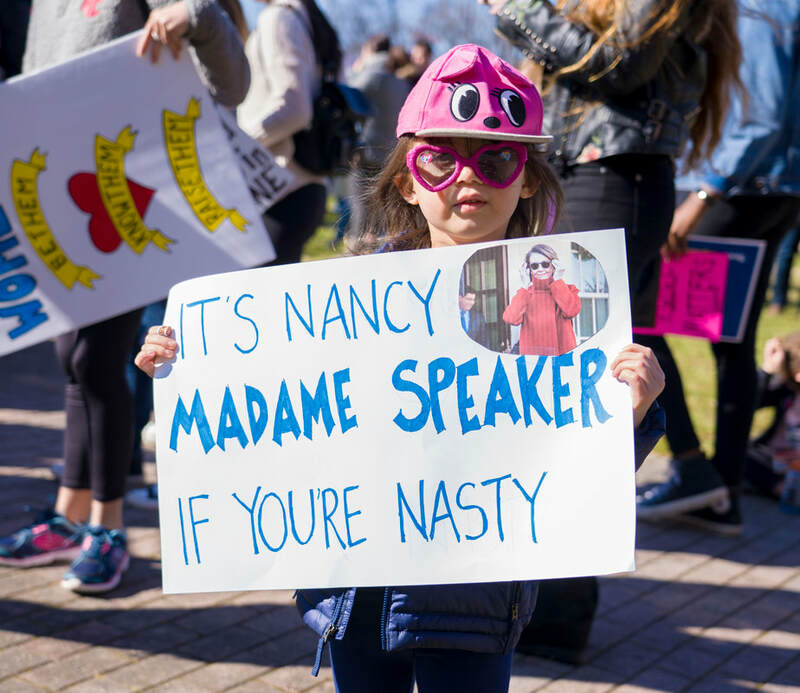 Signs and pictures: So many glorious signs were on display! 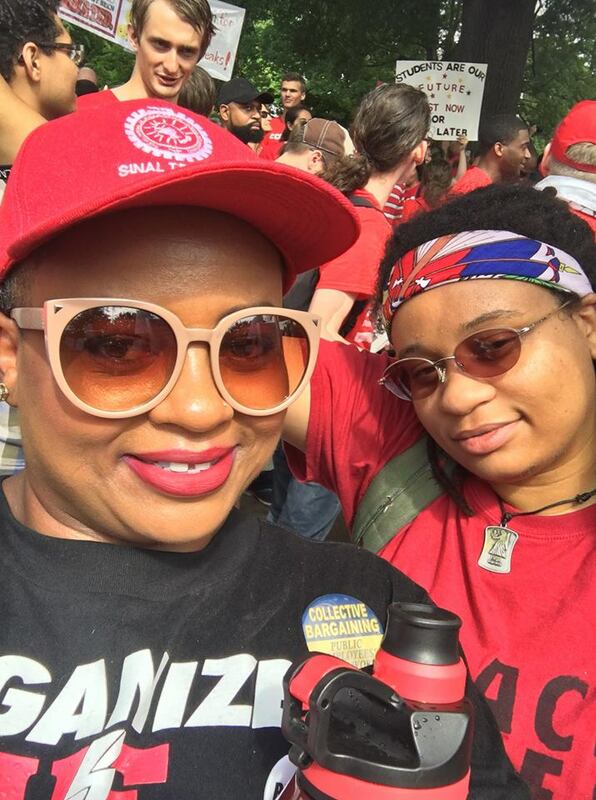 Plus, here are links to signs and people pictures from professionals who volunteered. Volunteers: We couldn’t do anything without our volunteers. 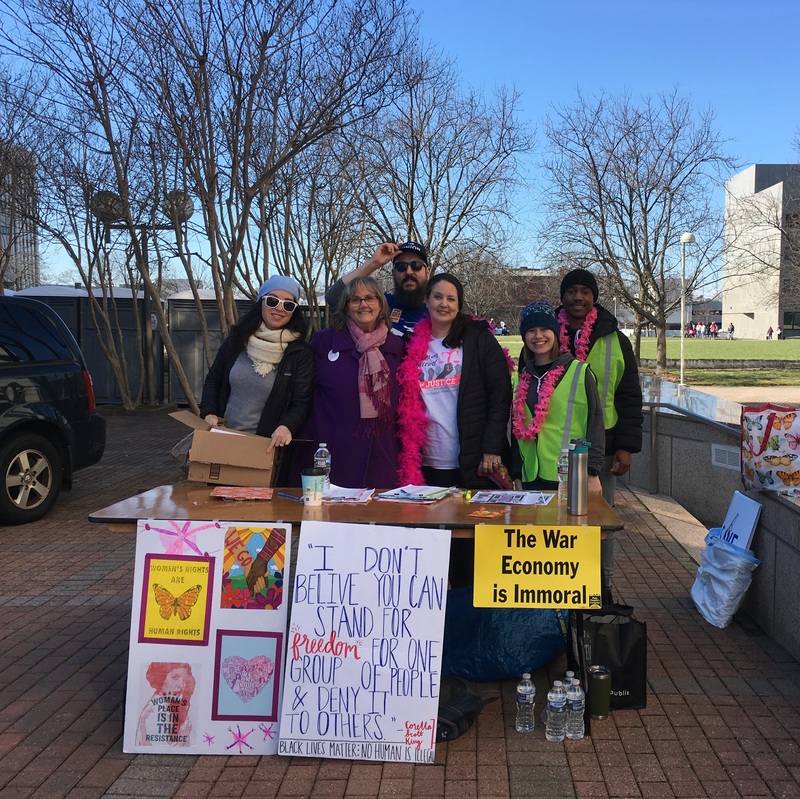 Community Partners: This year as in years past, one of the goals was connecting people to organizations doing the work we need. 42 organizations had tables set up on one side of Halifax Mall, and over 50 community partners signed up to show support for this event. Program and website: Special thanks to Penney De Pas for making the program and the website! 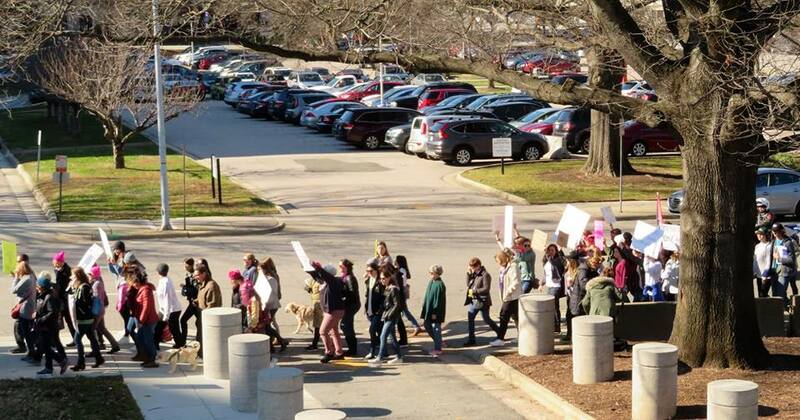 Media Coverage: See media coverage of Raleigh Women’s March at https://www.raleighwomensmarch.org/press-and-media.html. 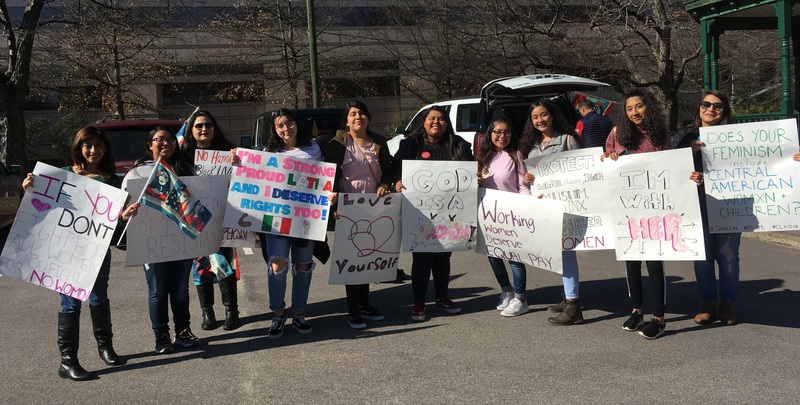 One of my favorite articles is “Women, men, march in Raleigh to show they’re not backing down,” 1/26/19, News and Observer. 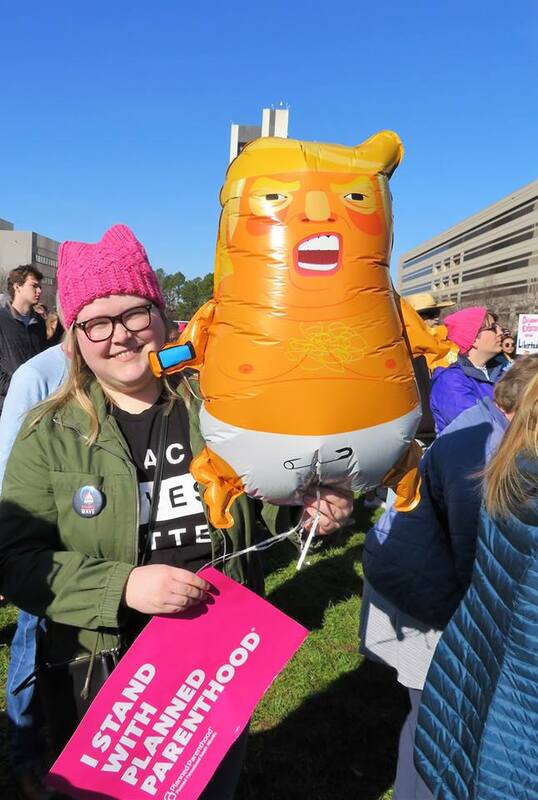 This entry was posted in #BelieveWomen, #StopKavanaugh, economic justice, Equal Rights Amendment, ERA, feminism, girls, global gag rule, immigration, intersectionality, reproductive rights, Roe v Wade, social justice, teachers, Title IX, Title X, violence against women, voter suppression, women, Women's march and tagged #StopKavanaugh, economic justice, intersectionality, social justice, women, Women's march. Bookmark the permalink.